Planes of Fame Air Museum P-38 Lightning "23-Skidoo"
Perhaps the most recognizable American fighter aircraft ever built is Lockheed's famous twin-engined P-38 Lightning. Fighting in every theater in World War II it earned the title of "Der Gabelschwanz Teufel"- the fork-tailed devil from Luftwaffe pilots that had the misfortune to tangle with a Lightning. Designed by a team headed by Clarence L. "Kelly" Johnson, who would later create the U-2 and SR-71 spyplanes, the XP-38 made its first flight on January 29, 1939 from March Field in Riverside, California. Though it was damaged beyond repair in a crash on February 11, 1939 the Air Corps saw enough to order 13 YP-38s as service test aircraft in April 1939. Full production orders soon followed with the 1st Pursuit Group at Selfridge Field, Michigan becoming the first unit to operate P-38s and P-38Ds in late spring 1941. These early Lightnings were armed with a 37mm cannon with a 15 round magazine and four .50 caliber machine guns, but they were not the combat ready version needed for the upcoming conflict. The first model to be deemed combat ready was the P-38F which had a 20mm cannon with a 150 round magazine to replace the 37mm cannon. 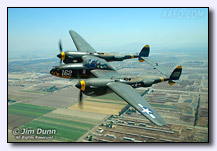 Power for the P-38F came from two Allison V-1710-49/-53 engines that were each rated at 1,325 hp. It was in August 1942 that the Lightning would achieve its first kill of the war, and also a share of the first victory for the USAAF over a Luftwaffe aircraft. On August 4th Lt. K. Ambrose and Lt. S.A. Long of the 54th FS at Umnak Island in the Aleutians each shot down two four-engined Japanese flying boats with their modified P-38Es; while on August 14th 2nd Lt. E. Shaham in a P-38F of the Iceland based 27th FS shared the kill of a FW-200C with a 33rd FS P-40C. Less than a year later on April 18, 1943 a group of 16 P-38F and Gs would conduct one of the most famous fighter missions of the war. Led by Maj. John Mitchell of the 339th FS they flew a 435 mile low-level mission from Henderson Field on Guadalcanal to ambush Japanese Admiral Isoroku Yamamoto. With precise navigation and timing they shot down the two transports and five fighter escorts over Shortland Island with the loss of only one P-38. 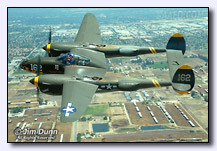 Over the course of the war the P-38 would demonstrate its value time and again. Besides being a great long-range daylight fighter it was also the best night fighter and photo-reconnaissance aircraft in the USAAF, as well as being able to carry a bomb load heavier than the standard load of a B-17 or B-24 heavy bomber. 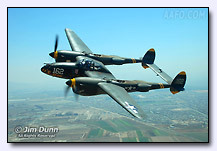 What may be the greatest testimonial to the Lightning is the fact that America's top two fighter aces of all time achieved all of their victories exclusively flying the P-38. Major Richard Bong of the 9th FS 49th FG ended his combat career in December 1944 with a total of 40 kills, while Captain Thomas McGuire in the 431st FS 475th FG was lost just as he was resuming combat with 38 kills already on the books. Also in the Pacific with the 475th FG was Capt. 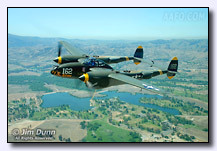 Perry J. Dahl flying his P-38J "23 Skidoo" in the 432nd FS. The native of Tumwater, Washington scored his ninth and final kill on March 28, 1945 after earlier surviving a mid-air collision with a Japanese fighter that led to a harrowing stay with his Filipino guerrilla rescuers. 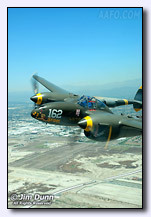 To salute 'PJ' Dahl, who would retire a Colonel in 1978 after flying two combat tours in Vietnam, the Air Museum Planes Of Fame in Chino gave their P-38J the markings that Capt. Dahl's "23 Skidoo" wore while with the 432nd FS. 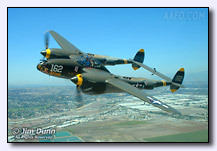 Restored in 1988 the museum's Lightning is P-38J-20-LO s/n 44-23314 that only saw limited duty with training squadrons in Texas and Florida before being surplused. 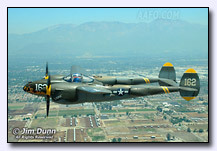 Museum founder Ed Maloney obtained the P-38 in 1960 with it having less than 120 hours on the airframe at the time. Though over 10,000 Lightnings were produced only a small number of them continued in service after the war. 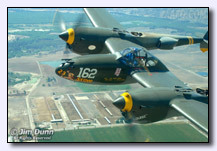 Today the sight of a P-38 is a rare one with only a handful still flying. While its service career was brief its legacy is secure in the history of great fighters. It was the only American fighter aircraft in service before the start of the war that was still in production at the end with additional orders on the books. This is a fitting tribute to the designers, builders, and those who took the Lightning to war. 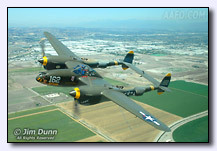 For more information about The Air Museum "Planes of Fame"; hours, exhibits, exhibitions and events, visit their website at www.planesoffame.org.